The New Inn, built without the bays, is situated in the Market Place next door to the old Black Bull and is one of the inns listed in 1822 when John Laybourn was given as innkeeper. He was followed by Abraham Dawson in 1825, the inn and cottage attached being owned by James Tempest, a butcher, who also owned most of the property in the yard behind. The annual value of the inn, with stables and brewhouse, was £15 in 1836, compared to £16 for the Black Bull. Nathaniel Dawson held the licence between c1830 and 1857. The Holmes family occupied it for over 58 years, followed by many more Landlords over the years. More recent tenants include the Rennison family, followed by Anthony and Jean Carruthers and then Chris White in 1987. Until 1921 a shop and cottage occupied part of the building on the immediate right of the inn yard, the entrance being by steps to a door built in the corner of the building. In the beginning of the last century, the shop was occupied by William Caygill, a china and glass dealer (also coal merchant). 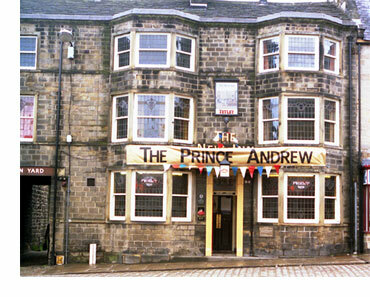 After his death the property became part of the New Inn. Chris White and his sister took over the Inn in 1987, but their dreams were shattered in November of that year by Tetley’s decision to sell it off as a shop. The Landlord said that Tetley’s wanted to sell the town centre pub as part of a large development. Mr. White had only taken over the pub in March that year and said he had spent a lot of money on refurbishing the building. In early March 1988, Mr. Chris White was given a stay of execution and was told by Joseph Tetley that the pub must close by the end of April but Leeds Planners decided to refuse the brewers permission for change of use. However, it was then announced in late March 1988 that the Leeds West planning committee had been told they could do nothing to stop the changing of one of Otley’s oldest pubs into a shop. Council planning officers explained that, under the Governments’ new classification rules for planners, pubs were classed as retail outlets. As such, breweries did not require permission to change the use of a building from a pub to a shop since they are defined as being one of the same thing. Plans for the New Inn included the demolition of outbuildings to the rear, alterations and an extension. In its original application, Tetley’s planned to redevelop New Market by creating ten shop units and a new pedestrian route linking Kirkgate, New Market and the Market Place. Later, in June 1988, it was announced that Leeds City Council had approved the planning application for change of use into a shop. Sadly, the New Inn closed on Sunday, 19th June 1988 with Chris White as Landlord, and leaving many customers wondering where they would drink in the future. The ground floor stained glass windows which faced the Market Place were removed by the developers following the closure as they had the Brewery’s name on them and were supposedly going to the Brewery’s museum. The owners certainly didn’t waste any time, for on the following Tuesday morning there was a Pentland Developments wagon parked outside. In September, only a few months following closure, builders working on the New Inn Court shopping complex discovered a well. It was lined with hand-crafted, curved sandstone to a depth of approximately 30ft – 40ft. Local historians who visited the site, believed it dated back to the 1800’s. At first it was thought that the well would be capped to allow an extension to be built over it, but none of the workmen believed that this would be the case. One of the labourers on the site said it was part of Otley’s heritage and that it should be kept, but the site agent had a less optimistic view. He said they wouldn’t fill it in but he couldn’t really see the architects changing their plans and would probably cap it up as first thought. A plea was made in October 1988 by Otley Tourism Association to keep the well because it would attract more tourism to the town, but all was to be in vain. In 2012 the property is occupied by Superdrug.